Edge Wind was spun out of Edge Aerodynamix to develop wind power applications of the Conformal Vortex Generator (CVG) tape and tab technology that they developed for aircraft wings and helicopter rotor blades. This technology increases annual wind turbine energy production, provides protection from erosion and impacts, reduces drag caused by leading edge erosion, reduces startup speeds, and reduces vibrations. The CVG tape and tab is installed rapidly by two technicians on a rope rig or aerial high lift with minimal surface preparation. 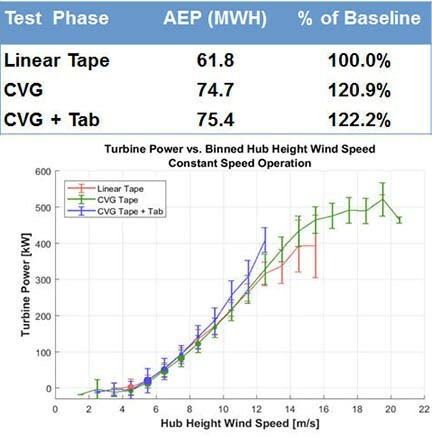 Edge Wind has worked with the U.S. National Renewable Energy Laboratory to collect data over an eleven month period on the performance of the CVG and Tab relative to industry standard edge protection tape on the 600 KW CART 2 wind turbine in Golden, Colorado. 5 minute average power and wind speed over five data was collected. The data was filtered to remove noise from unstable wind. Data for the baseline was limited at wind speeds over 15 meters per second and data for the CVG + Tab is still being collected The improved performance over the CVG and Baseline is expected to continue once data is collected for higher wind speeds. NREL reported a 22.2% increase in KWH production from the CVG and the Tab relative to a conventional leading edge taped blade along with a 20.9% increase for the CVG alone. This shifts the power curve between the cut-in and full production wind speeds. “This technology has the potential to add the equivalent of an extra 100 GW of wind capacity globally without having to install a single additional turbine,” said Edge Wind CEO Ranbir Sahni. AEP for CVG+TAB was limited due to reduced wind strength during test period (which is ongoing). AEP based only on improvement for range of test data, not extrapolated to show probable AEP for equal wind range. Edge is currently looking for field trial sites with GE, Vestas, and Siemens Gamesa turbines and low turbulence in the US & EU to collect the data required to CFD model and optimize the design for each turbine brand. Based on our experience from the B737 test process, we expect that turbine model specific optimization will yield additional increases in power output. Visit Booth #2586 at the AWEA Wind Power show for a briefing on the NREL test results report and how your wind project could benefit from a field trial with Edge Wind and NREL. ← CVG Lab Testing on Wind Turbine Performance.